And in the City, the area of Central American Boulevard near its intersection with Fabers Road has long been the scene of a number of shooting incidents. That area is considered a hot spot where another early morning shooting left one man suffering from gunshot a wound to the hand. 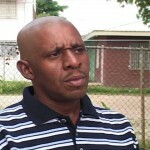 News Five spoke with Police Press Officer Fitzroy Yearwood who says that one person is being questioned. Prior to today’s incident the last shooting in that immediate vicinity claimed the life of Elmore Neal when he was shot by a police officer who allegedly acted in self defense. oh yes! surely we can have dem idiots running around with guns but we surely cant give a security gaurd posted at a bank a gun to protect himself n customers!!!!!! G.O.B.= IDIOTS!!!!!!!! You cannot even take a morning or evening stroll in belize these days, some idots are running around with a gun ready to end your life. That area is a constant blood bath, the government should burn that whole area down and build a wall around the city. We can keep on sending our comments over and over in regards to the violence that are going on in Belize, but the truth of this issue is that the government does not really want to do anything about it because the police force, drug kartel and government are in the violence themselves. The only ones that are being blamed are the ‘thugs or gangster may I say.’ The government, drug kartel and police force are the ones that are given these youngsters the ammunitions and the drugs to destroy the communities of Belize, so when you see the on going violence you first have to look at the leaders of Belize to find the real answers. In my regards they are the ones that are killing the people of Belize not the thugs – the thugs are just doing the killings because in their world that’s their jobs. They get paid to take some one out. If the government could only create jobs for the youths in Belize, then is when I think the violence would decrease and the youths would have confidence and more meaning in their lives. Until then, any time we log on to view the news I believe we will continously view violence that are taking place in Belize. What’s so sad is that I’m a Belize born and I’m proud to call Belize my country, but the rate that Belize life style is growing; I would reconsider not retiring in Belize, but stay else where, which I’ve never imagined it would be some thing I could consider, since Belize being my true home. Honorable Dean Barrow, I can only wish that you see the callings and cries of the people of Belize and try and create gang prevention modules to address the problems that are taking places in the underserving communities of Belize. May God continously bless you with strength in hopes of helping Belize be safe. We have to hold our selves accountable to ensure that the youths have a future for tomorrow! We inherited a corrupt police force from the previous administration and like everything that we have to sieve the cleaning process takes time. However blaming the government is one true thing, but what about blaming all the Belizeans that left kids back here and went abroad,kids left without discipline,left to fend for themselves. I know of mothers and fathers that have two sets of kids one in the us they live with and one in Belize they don’t maintain. I am not saying every belizean living in the US has doen this but some of them who are the same ones blaming the plights ib Belize on the govt.